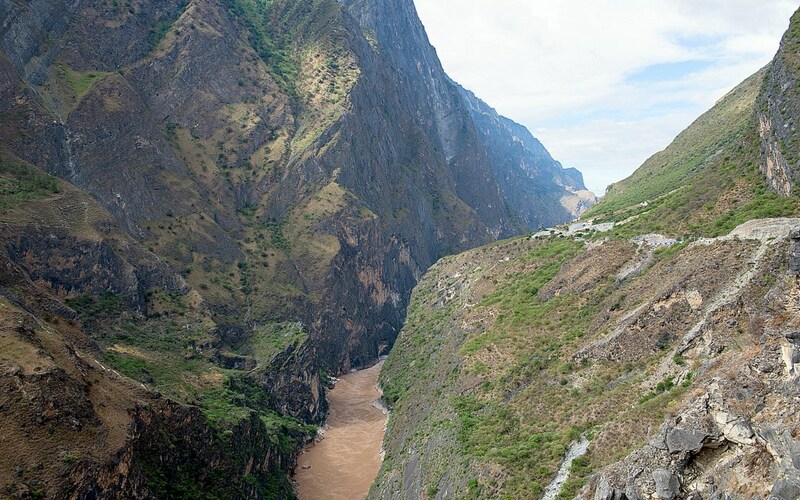 I'd jumped the gun a bit by writing about where to stay at Tiger Leaping Gorge before documenting how I got there and what I saw when I arrived at this amazing slice of Yunnan topography - linear timelines are not my forte. So here's finally a photo and phone-cam video essay on my Tiger Leaping Gorge adventures from this past summer. So this was my first real sight of the Jingsha River as our bus turned into the middle trail (and the only roadway in and out of) Tiger Leaping Gorge. I have to admit I was a bit underwhelmed after all that I'd heard about this place. 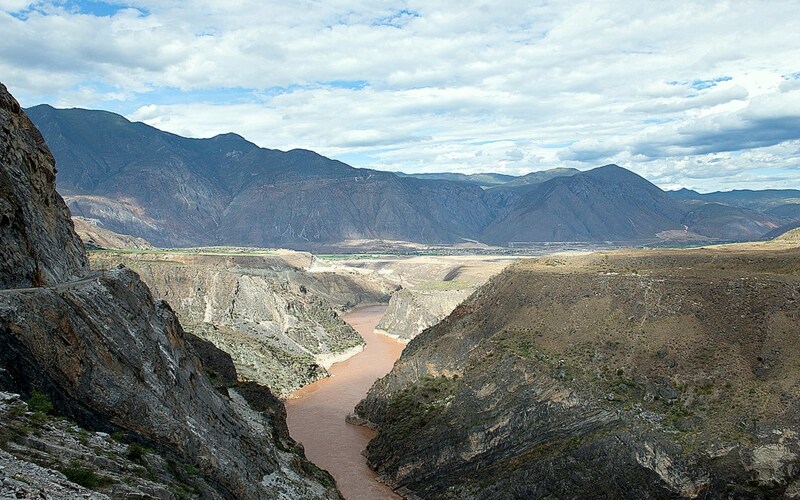 It just looked to me like a giant tributary, one of many, may brown sludgy ones I've seen in my travels to China. Yes, oh ye of little faith and all that sort of thing. 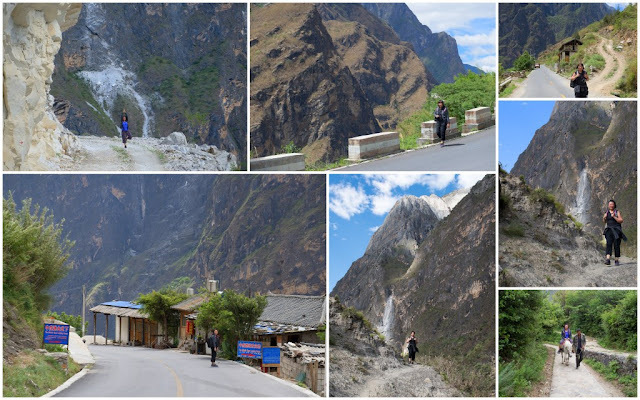 At this "entrance" to Tiger Leaping Gorge, our bus stopped to let most of my fellow bus mates who wished to hike the upper trail disembark. 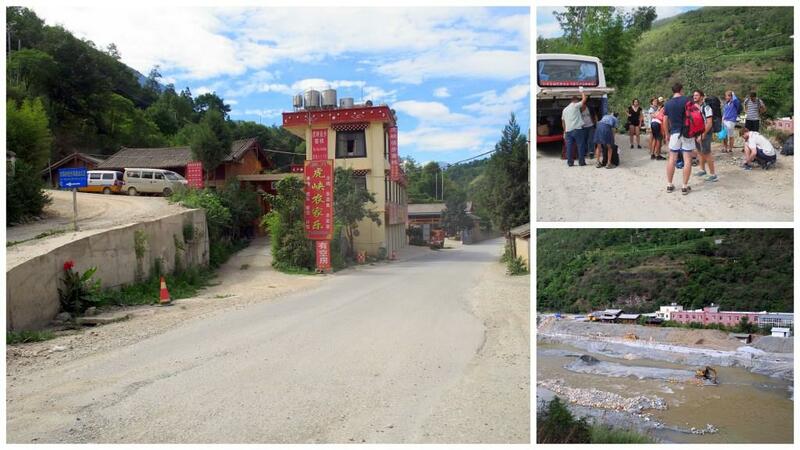 The Naxi Guest House on the left photo is a good place to stock up on last minute snacks and drinks, as well as, you know, loo breaks. The rest of us on the bus - all four of us not-so-intrepid random wannabe hikers - continued on our bumpy ride on the middle trail/roadway. 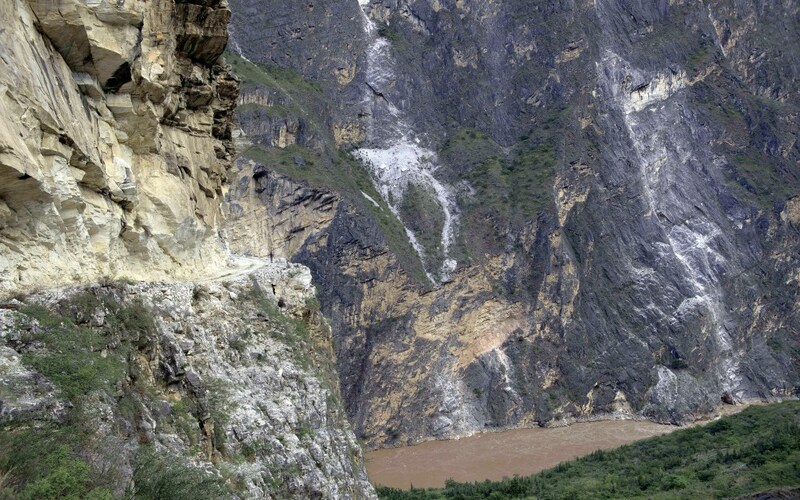 We were flanked by the sheer cliffs of Haba Snow Mountain on our left, and the Jingsha River sometimes uncomfortably too close on the right. 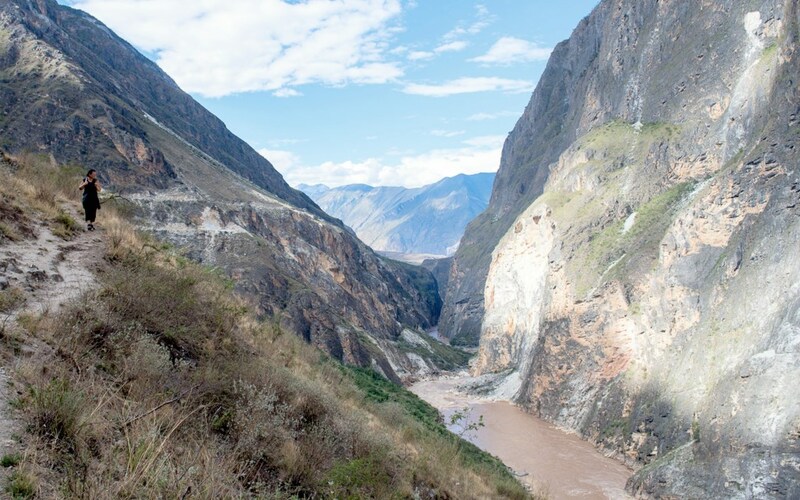 The video below is a better illustration on what it's like being in a vehicle careening around next to the deepest gorge in the world. Definitely not for the vertigo inclined. After a semi-harrowing but exhilarating bus ride, we were dropped off at Tina's Guest House. Incidentally, it's a 20-minute ride from the Gorge's entrance to this point, which would take those hikers in the earlier photo two days on the upper trail to get to this same place. From there, it's a leisurely one-kilometer walk to Tibet Guest House where we were booked to stay for a couple of nights. 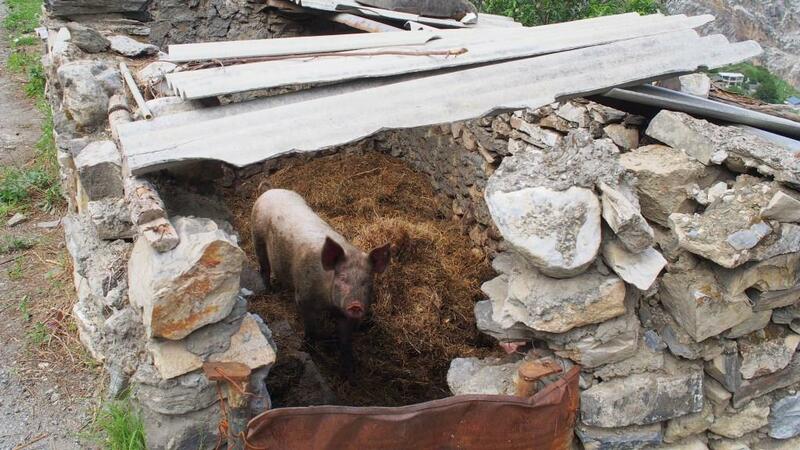 This is the sight that greeted us more than halfway to Tibet Guest House. What you're seeing there is Walnut Village (yes, they do grow walnuts there) where a couple of trails leading down to and near the Gorge begins/ends. Occasionally, we shared the roadway with herds of goats, chickens, dogs, and occupied pig sties. After checking into Tibet Guest House and determining that we were ok for oxygen levels (we knew we were fine as we weren't gasping for air after each sentence,) we decided to take one of the trails down to the Gorge. 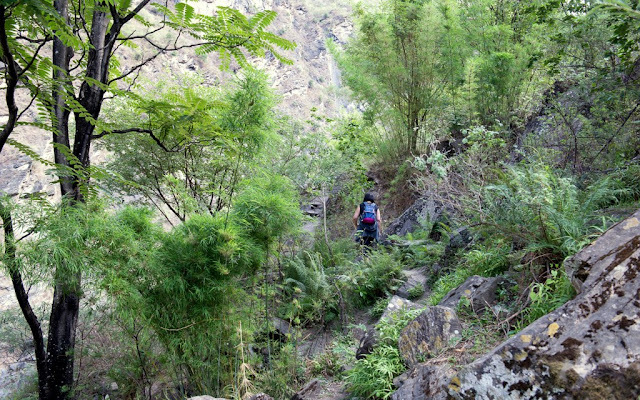 If you can believe it, this is the lower part of the lower trail of Tiger Leaping Gorge. And yet, we were still nowhere near the river's edge. More gawking at the magnificent view. So yeah, we didn't hike the upper trail of Tiger Leaping Gorge. The one that everyone is supposed to do. To tell the truth, I had neither the faith (nor stamina) to tackle that trail's infamous and ominous-sounding "28 Bends" on high-altitude limited oxygen levels - so that's why we opted to traipse along this lower trail in hopes of getting splash-close to the rushing water. No such luck, although it made for some awe-inspiring images and rip-roaring acoustics even at a few hundred feet above the Jingsha River. Taking a breather a couple of hours into our hike and wishing we weren't such amateurs who had neglected to bring along bottled water. That climb back up to the middle trail was a doozy; it was only a kilometer up as the crow flies, but it took us more than an hour to wheeze and gasp our way up, about four to five steps at a time. 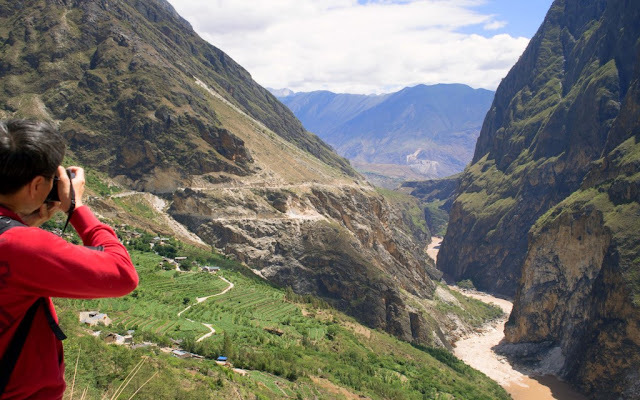 Tiger Leaping Gorge is by no means a massive place - it is about 30 kilometers from end to end, with guest houses and farms along that two-lane paved roadway. But it made for a lot of great walks for the three days and two nights we were there. This is one of the trails I explored. That's me in that tiny black speck in the middle/left of the photo. On the second day, we hired the son of Tibet Guest House's owner Mr. Lu to take us (plus two fellow guests) on a driving excursion to nearby Haba Village and the famed Bai Shui Tai or White Water Terraces. 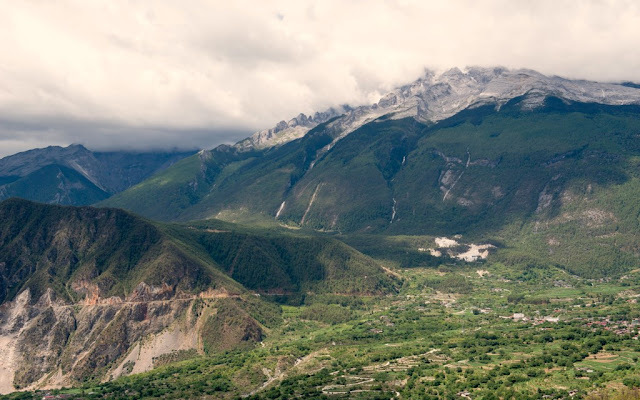 They're not far from Walnut Village of Tiger Leaping Gorge, but we pretty much stretched it out to nearly seven hours due to the many, many stops we took to take in the sights (and deplete our cameras' memory cards.) 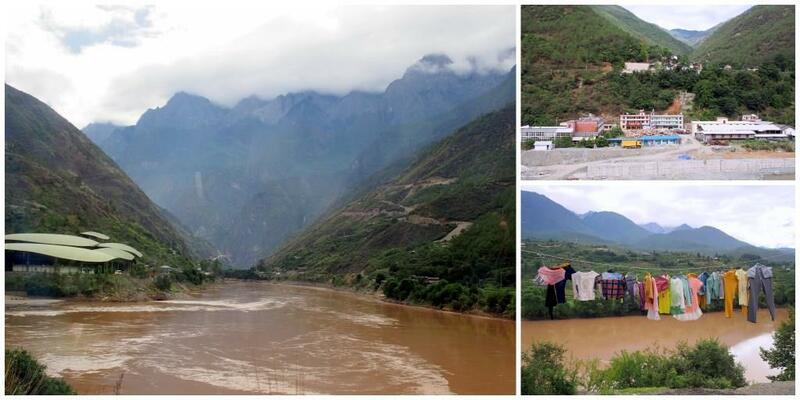 By the way, as you can already tell, the infrastructure in these semi-remote locations in China is second to none. 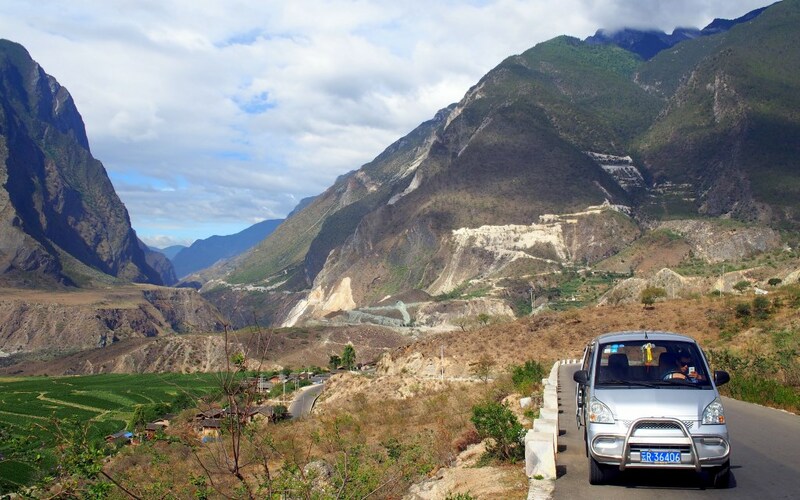 The roads threading through the villages and mountain passes were all smoothly paved and there were multiple signs from mobile service providers that proclaimed the strength of the mobile/date bandwidth connections. 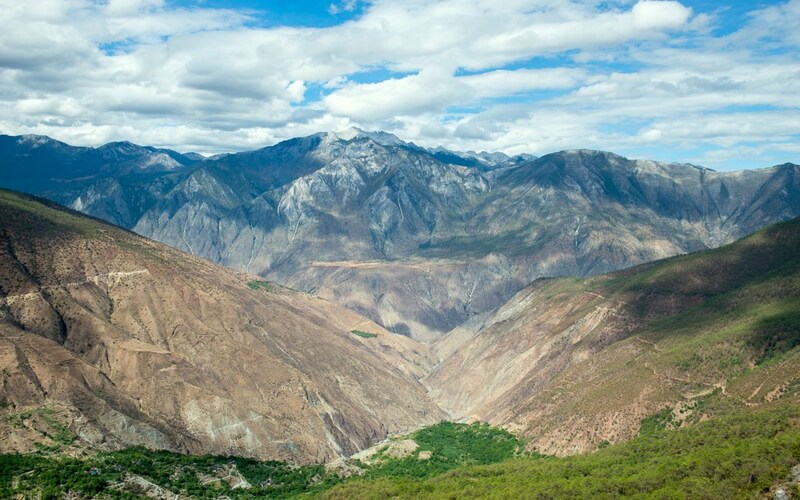 View of the Haba Snow Mountain and valley below. This is at around the 30 km mark of Tiger Leaping Gorge, enroute towards Haba Village and Haba Mountain Pass in the far distance. 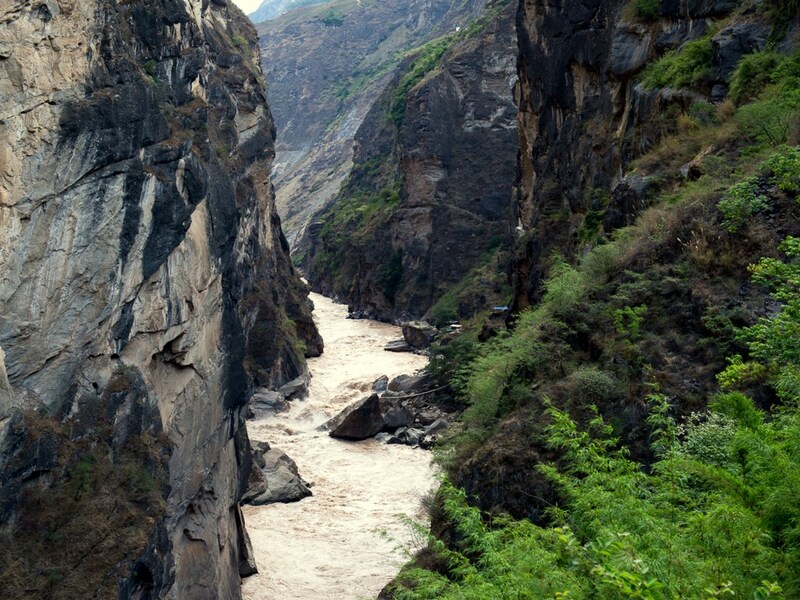 Map of Tiger Leaping Gorge. 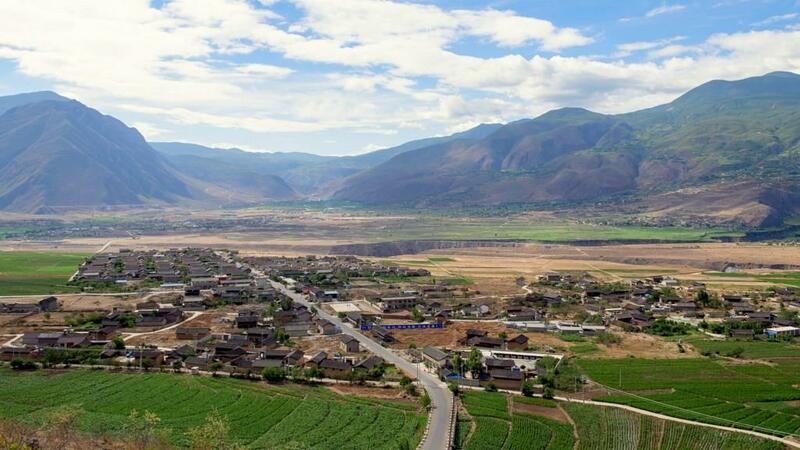 We drove in from Lijiang from the southwest, went in the northeast direction, and stayed at Tibet Guest House at Walnut Village (or Garden) at around the 26km mark. 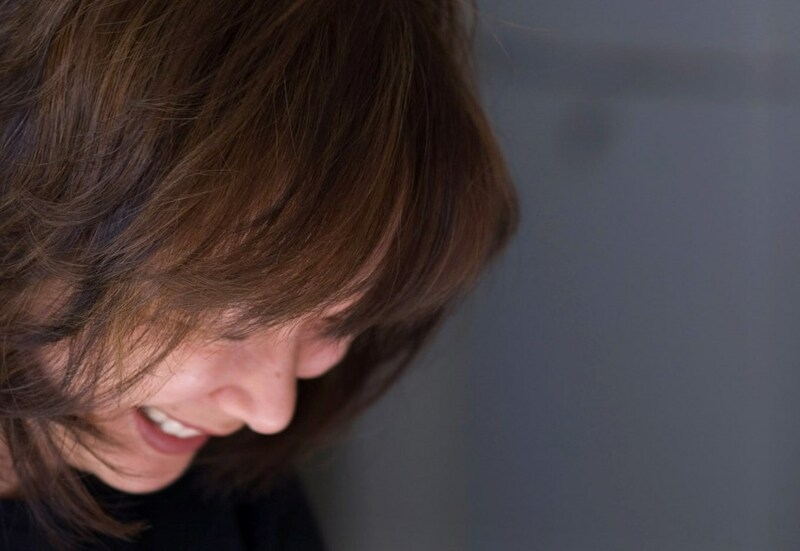 One more time, but with feeling.